Despite nearly a century of use, the Bacillus Calmette-Guérin (BCG) vaccine continues to be controversial, with known variations in BCG substrains and vaccine efficacy. Because vaccination policies and practices vary substantially across time and countries, we created the first edition of the BCG World Atlas, a searchable online database of global BCG vaccination policies and practices, in 2011. The interactive website provides detailed information on current and past BCG policies and practices for over 180 countries. 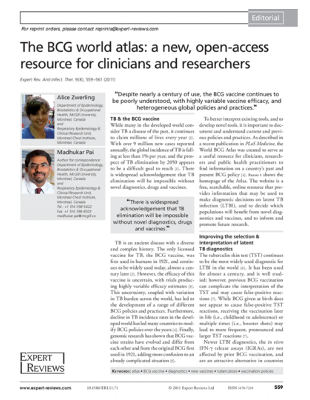 The BCG World Atlas is designed to be a useful resource for clinicians, policymakers and researchers alike, providing information that may be helpful for better interpretation of TB diagnostics as well as design of new TB vaccines. For example, BCG practices can impact the results of the tuberculin skin test, the most widely used test for latent TB infection, and past BCG policies and practices may be as or more important than current policies in interpreting TST results in adults or in deciding when alternative tests for latent TB infection, such as interferon-g release assays (IGRAs), may be preferable to TST. If novel TB vaccines complement the existing BCG vaccine, it would be relevant to know what previous BCG vaccination individuals have had, how many, and at what ages prior to administering novel ‘booster vaccines.’ In summary, the BCG World Atlas provides the TB community with a useful resource through an open-access and easy-to-use website. 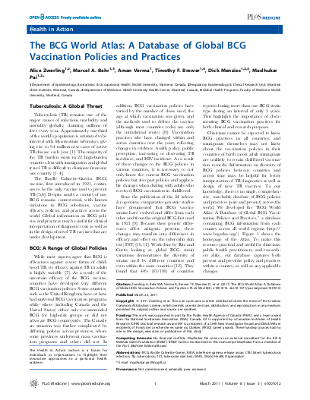 In the 2nd edition of the BCG Atlas, we present updated data on BCG vaccination policies including changes made to these policies since the initial site was created in 2011. New data has also been collected including whether the tuberculin skin test (TST) is administered prior and/or post BCG vaccination, site of BCG placement, special policies concerning BCG in HIV infected infants, BCG vaccine manufacturer and supply company, the length of time the current BCG strain has been in use, shortages or stock-outs of the vaccine, details regarding how the BCG vaccination policy is reassessed, and links to online versions of national BCG policies. For more information, please read our blog post on Nature Microbiology about the 2017 update. Help us keep the BCG World Atlas up to date! Please refer to the ‘Contribute’ section of the website to download and submit the questionnaire and contribute BCG data to the atlas. On the same page, you can send us any questions, comments or feedback you might have. Our contact information is also listed on the Team page.